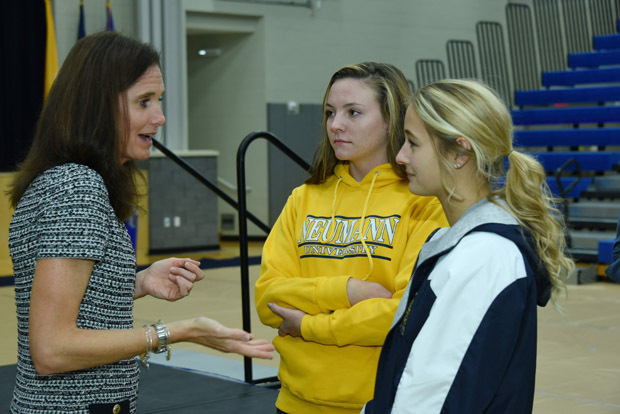 Haley Scott DeMaria (left) speaks with some of the approximately 300 student-athletes at Neumann University, Aston, on Monday, Oct. 19. Following a horrific crash of her team’s bus, doctors told Notre Dame University swimming star Haley Scott DeMaria she would never walk again, let alone swim. But driven by her Catholic faith and the memory of two teammates who died in the 1992 crash, De Maria recovered. She walked up to the dais and stood to receive the fifth annual award from Neumann University’s Institute for Sport, Spirituality and Character Development Oct. 19 in Aston, Delaware County. “All I knew was that I was cold and my back hurt,” DeMaria explained of the accident’s aftermath during her award acceptance speech before approximately 300 members of the Neumann community, along with the eighth grade class from Philadelphia’s La Salle Academy who were special guests for the presentation. After undergoing emergency back surgery DeMaria learned she would never walk or swim again. But the diagnosis did not stop her. DeMaria would defy the odds and the experts and, after multiple surgeries and extensive rehabilitation, live to walk and swim again. The recovery was a struggle but she largely credits her faith and desire to honor her deceased teammates with keeping her strong. DeMaria believes God’s goodness played a key role in her recovery. “Keep praying. God listens, but doesn’t always answer in the way we think he should,” she advised the audience. In a particularly powerful anecdote, DeMaria told how years after her recovery she encountered a woman who had prayed for Haley and for the Notre Dame swim team after their accident. DeMaria was blown away by this experience. “For her to have met someone she prayed for… and finally to be thanked” moved DeMaria and motivated her. Around this time, she realized her story needed to be shared to offer inspiration and guidance to others. Years later, for example, she met a young mother battling breast cancer. In the book she reveals her recovery process and the many painful surgeries, as well as how swimming helped her heal. At the same time she had to come to terms with her physical limitations, and she describes how she leaned on her faith after hitting bottom during her physically and emotionally painful recovery process. DeMaria’s story will continue to inspire with a planned film adaptation, currently in pre-production. It will be only the third film shot on Notre Dame’s campus. Today, DeMaria still swims and finds inspiration through sports. “Swimming is both good for the mind and body,” she said. 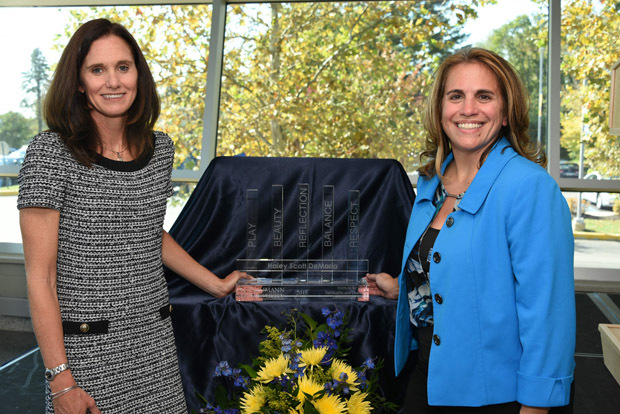 Haley Scott DeMaria (left) and Lee DelleMonache, director of the Institute for Sport, Spirituality and Character Development, stand with the institute’s award.